Over 1,500 of the 3,663 artists in my collection do not have images - picture below shows those with most albums. I have tried refreshing Roon cache so I don’t think that’s the cause. Whilst most are obscure (and I’m not surprised at no image) I would have thought that others (e.g. Cara Dillon, Copperhead) would have images. Anyway, I started finding and adding images, resizing them first before adding to Roon. It’s a long-winded process - I have done 269 so far with 1,313 to go! What would make it much easier would be the ability to point - within settings - to a folder which has artist images. Roon would then add the images (using the artist name to match to the image (jpg) file and automatically add them. I think this is a great idea, certainly if we were able to contribute. You mentioned Cara Dillon as an example. I think this is a good idea for the individual user, but not for adding to the online Roon database that is shared across all users, as you seem to be suggesting. There would be copyright issues involved. Do you have the original album art or must to find it? I keep a folder.jpg in the album directory, Roon will use this. There are programs that will retroactively add folder.jpg, for example PerfectTUNES. Edit: DOH! I misread Artist. 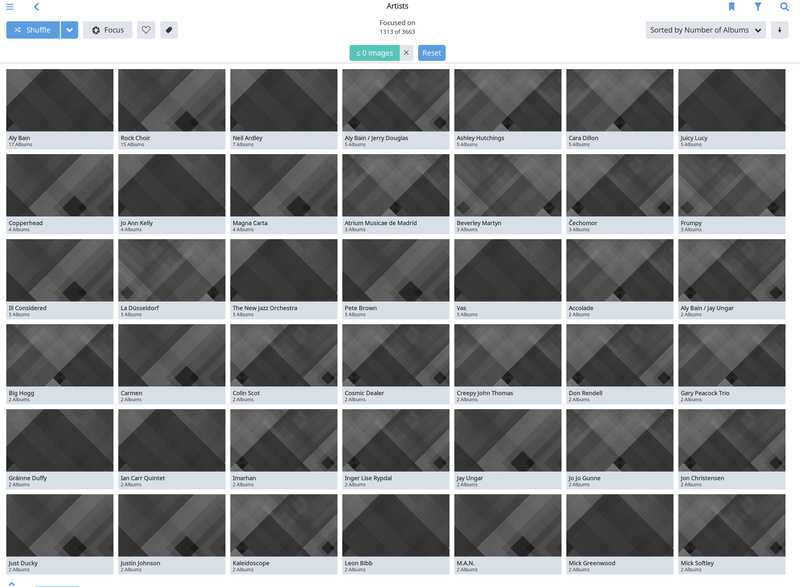 Album artwork is not the problem - every album has this as folder.jpg - it is the artist picture that is missing. As far as I know the only way to add this is to edit the artist and add the image. Doing that is a tedious process hence the feature request. Is the most tedious part finding the image or adding to Roon, since you could probably use https://fanart.tv/ to find the artist image in some sort of semi-automated way.